India Railway has released ACT Apprentice form for south eastern railway region . check details here. The candidates can pay the application fee through online mode by using credit card or debit card or net banking. Educational Qualification – The candidates must have passed 10th examination under 10+2 systems from a recognized board and must possess ITI in relevant trade from a recognized institute. 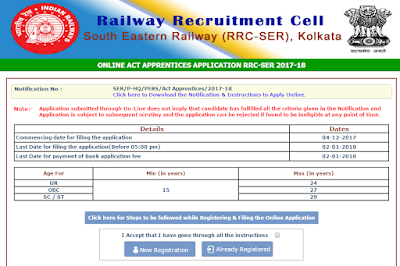 How to Apply – Candidates who are fulfilling the eligibility criteria can apply online through the official website of RRC South Eastern Railway from 04-Dec-2017 onwards. The last date of online application is 02-Jan-2018.